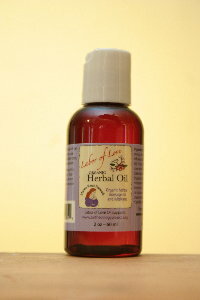 Labor of Love Herbal Oil contains herbs that can be used to help sore muscles and joints, bruising, swelling, inflammation, tearing, scarring, and stretch marks. It can be used for pregnant bellies, as well as for an incredibly relaxing massage during pregnancy or childbirth. Herbs in Labor of Love Herbal Oil can also be used to encourage labor progression with perineal or cervical massage, as the herbs used are known to help ripen the cervix. May help to decrease and soothe birth discomfort, and promote rapid healing. Oil can also be used vaginally to provide a natural lubricant (not to be used with condoms). Midwives, doulas, massage therapists, and expecting mamas enjoy the varied uses of Labor of Love Herbal Oil. It has a mild herbal scent that is not overpowering, and is light enough that a favorite essential oil can be added if you wish. Contains *sunflower oil and *jojoba infused with *calendula, *St. John's Wort, *evening primrose, *lavender, *arnica, *rosehips, *chamomile, *helichrysum, rose petals, Monoi de Tahiti, and vitamin E. 2 fl. oz.